Ciclovía – a familiar term to any bicycling enthusiast, where popular roads turn car-less for people to play and literally rediscover their streets. These open-street celebrations have trademarked bike-friendly cities around the world since the first Ciclovía was hosted in Bogotá, Colombia, in 1976, when the town closed one road to all cars and opened them for pedestrian use. Photo from CicLAvia in Los Angeles, California, this June. Since then, the trend of people enjoying their streets without the stress of car traffic has made its way around the globe and into major cities where residents embrace these opportunities – in Bogotá, the Ciclovía still remains a city tradition every Sunday. Since its conception in the late 70s, Ciclovías have swept the world, taking over main cities in Australia, New Zealand, Peru, Argentina, Canada and now, the United States is pedaling along. Turnout for Los Angeles’ “CicLAvia” has been recorded at 180,000 people, while San Francisco and Portland regularly draw 30,000-40,000 with their “Sunday Streets” and “Sunday Parkways.”. We are finally getting in on the action, announcing San Diego’s first open streets celebration in history. 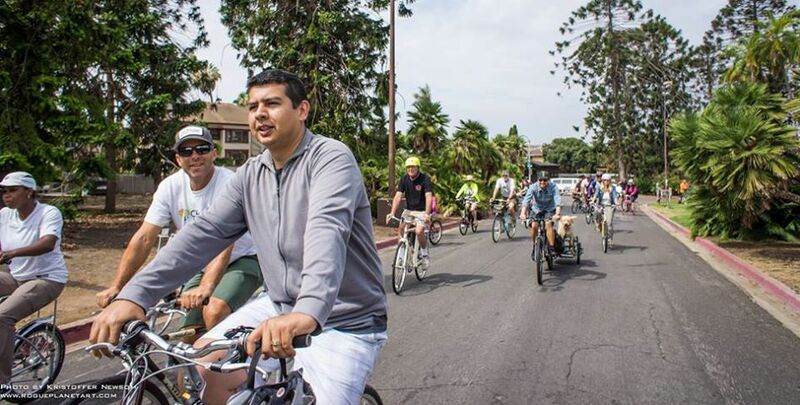 With strong city support and passionate bicycling advocacy groups, San Diego’s own version of Ciclovía presents itself to the public on August 11, by the name “CicloSDias” (sick-los-dee-us). More than five miles of popular roadway will become car-free for anyone and everyone to explore the streets with neighbors and local businesses. This is not your typical cycling event where you expect an entry fee and a start and finish line. This is a free celebration coursing through the communities of City Heights, Golden Hill, North Park and South Park – connecting neighborhoods, friends and local businesses by encouraging people to get out and experience their streets in ways they can’t from inside their cars. Donations to support the free event and a future of open street celebratory events are being accepted by the city’s newly launched Crowdfunding Campaign, with a goal of $15,000 for an unforgettable CicloSDias. San Diegans need not wait for this exciting bicycling event to roll through in order to enjoy time on their bikes. San Diego’s premiere bike path, the Bayshore Bikeway, is in its completion stages. Once finalized, the path provides 24 miles of nearly car-free paths for cyclists to pedal around San Diego Bay, through Imperial Beach, Coronado, Chula Vista, National City and downtown San Diego, ranking it as one of the top bike paths in the country. The city hosts its sixth annual Bike the Bay, an organized ride crossing the Coronado Bay Bridge and highlighting completed parts of the renowned Bayshore Bikeway, on August 25. Shortly after, the highly-anticipated Tour de Fat makes its San Diego appearance with an animated costume bike-ride, carnival-esque attractions and New Belgium beer on September 28. Not only are new paths being built for sightseeing and exploring and bike-loving events highlighting San Diego, but local urban areas and businesses are embracing our up-and-coming cycling culture as well. The San Diego County Bicycle Coalition (SDCBC) and the San Diego Business Improvement Council worked together to create the nation’s largest Bike Friendly Business District. What do all of these long words mean? Basically, San Diego businesses love people on bikes, and want to see more of them. Customers on bikes are especially encouraged by the businesses in Pacific Beach, Ocean Beach, North Park, El Cajon Boulevard, Adams Avenue, Hillcrest and East Village. These neighborhoods aim to promote the local economy, alleviate parking and traffic congestion and make the business districts more bicycle friendly. As part of these efforts, business districts throughout San Diego are each hosting their own Bike Local Sunday; a monthly event, each time highlighting a new area and bringing local businesses and cyclists together to support each other with a day of neighborhood interaction, exploration and biking. For those without bikes of their own- you can still be a part of the cycling fun. As of this July, DECO bike-share was unanimously approved by the City Council for implementation in San Diego, placing bike stations throughout the city where people can rent a bike from one station and drop it off at another at a very low cost. Residents can expect to see the bike-share coming to fruition with 180 stations and 1,800 high-quality, rentable bikes in early 2014. San Diego is experiencing a shift in the way we think about transportation and our commuting culture – becoming a place where cyclists and cars share the road peacefully. In this world, open streets celebrations are regular occurrences, high-energy cycling events roll through town on a consistent basis, bike paths are safe and luxurious for families and residents, and bike-share is a primary commuting option. As executive director of SDCBC, my job is advocating for and protecting the rights of people on bicycles. But more than this, I see first-hand how passionate our city has become about biking and how it is more than just a Plan B or weekend activity- it’s turned into a way of life for so many of us. How do I see the future? All transportation options intermingling harmoniously, on a road paved with green bike lanes, of course. Andy Hanshaw is the Executive Director – San Diego County Bicycle Coalition; MPA, has been Executive Director at the SDCBC since July of 2011. He is also the founder and organizer of the annual Bike The Bay community bike ride that takes place each August in San Diego. why are bike lanes so big? look at that photo, the white and green lines take up most of the road. Bike lanes are designed following specific state and national standards, although the engineers often need to exercise their judgment to apply those standards to a specific road. Just an FYI that there is a local cruising club that throws slow-moving, family-oriented group rides once a month in four locations: OB/PB, Carlsbad/Oceanside, Coronado, and Santee. They average between 50-90 riders, with OB/PB and Coronado as the most popular. Anyone is welcome to join on any non-motorized bicycles. Electra Bike Forums, or EBF, is meeting up before CicloSDias to ride it together.